Before spending large sums of money on a big system to propel a boat I wanted to get a better sense of how to go about building a system and how to avoid having the project fail. So the first step was to build a prototype system. I could try things out with the LiFePO4 technology at a much lower cost while also creating a useful piece of equipment in its own right. Early on I realized that 4 LiFePO4 cells in series would generate 12 volts. So I went with 4 cells. I also had to figure out whether to top balance or bottom balance the cells. Some people like to bottom balance their cell stack but that takes a good bit of effort to get it set up correctly. Top balancing is easily done by topping off each cell with a 3.6 volt charger before assembly. Then during discharge and subsequent recharge the cells should top off all at the same time. Top balancing and bottom balancing is covered extensively elsewhere. 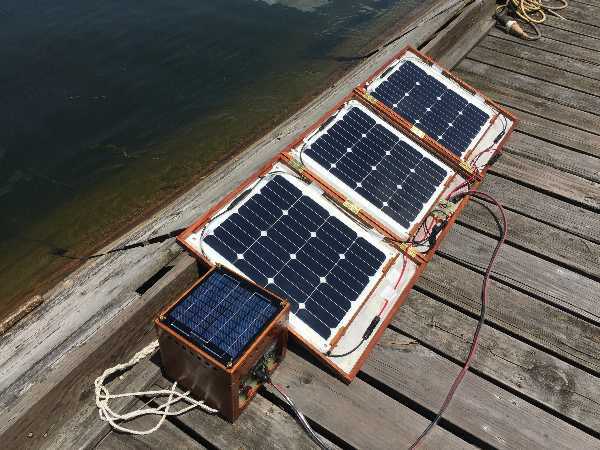 To build the P3C I needed a solar panel, a charge controller built for LiFePO4, a battery management system (BMS), and a set of four LiFePO4 cells of suitable size. I also needed some ancilliary bits such as fuses, ammeters and volt meters, 12v cigarette lighter socket, and various switches. Also needed was a quick balance checker and a thermal management system. I wanted the unit to be about 10% of the capacity of the larger unit. Once I defined and acquired the parts I needed to figure out how to arrange them. The system had to be built neatly and be easily disassembled and accessible. Everything also had to fit in a 10" cube. Hence some prototypes. After a couple of iterations of trial and error I arrived at a workable arrangement. At this point I took the time to build a nicer box. I also went through some iterations of the solar panels. The first was based on an aluminum frame as pictured here. I later built a hinged box consisting of plywood panels riveted to aluminum C channel frame to keep the weight down. Neatly organized wiring is a big key to safety and reliability. To improve reliability and safety it is good to try to organize the wiring as neatly as possible. This makes it easier to maintain, troubleshoot and make future modifications. Shown here is the battery management board. This board has 5 inputs wired to the cells so it can continuously monitor the cell voltage. Each cell has a fuse. The BMS has two outputs. If any of the individual cell voltages fall short of 2.5 volts it shuts down the outputs so that the stack cannot be further discharged. At that point an external charging source must be applied to reactivate the BMS. This BMS also has built in short protection. All the wiring and electrical parts are mounted on G10 board. Another safety enhancement is the use of noncombustible substrate for mounting the components and wiring. G10 is a good material since it doesn't support combustion. G10 is made of fiberglass and epoxy. When a G10 board is tapped it rings sort of like a sheet of tempered glass. However it is quite shatter proof. It glues up nicely with West Epoxy. Just to be sure I tested the combustability of G10 by lighting up a sliver with a match. It charred but as soon as I removed the match flame it went out. This lessens the chance of arcing leading to a fire. The four switches on the left are in between the positive terminals of each cell and the battery side of the BMS. All of them must be switched on for the box to be turned on. I had this arrangement for a while to check how the shutdown feature of the BMS worked. I later removed the switches and repurposed the holes. The square push button below them is used to energize the box. 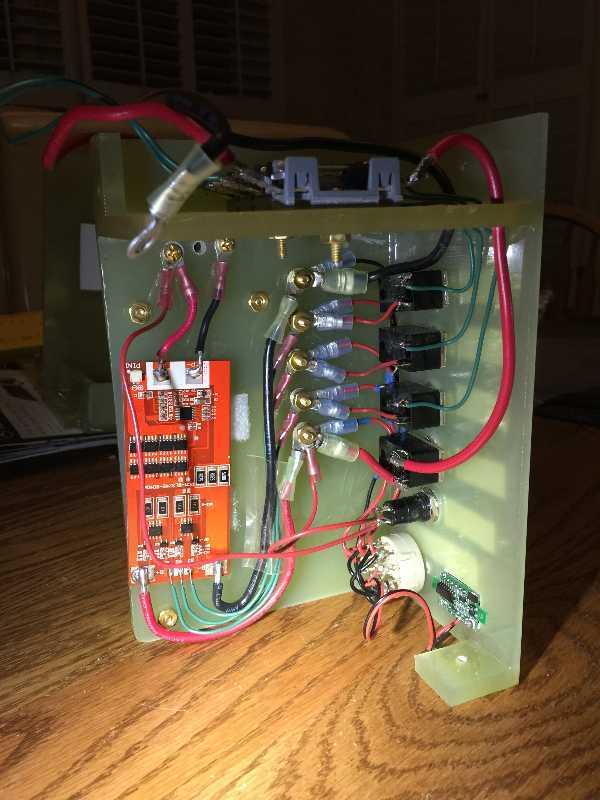 It temporarily bridges the 12v output with the charge controller as a bypass. The BMS must have charge applied to turn on. The Solar charge controller must see a battery voltage in order to operate. This is a catch 22 situation. 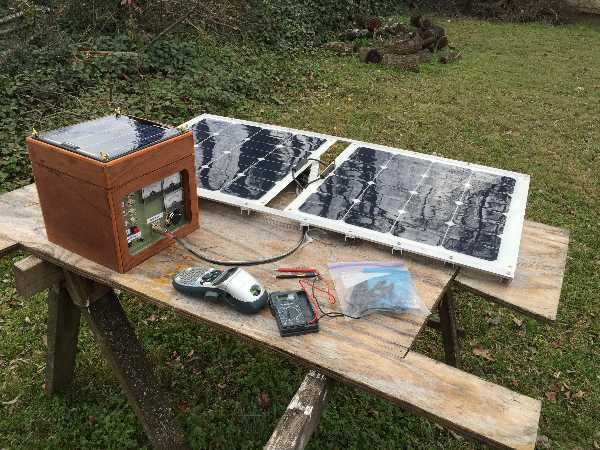 Batteryspace provides a workaround so that the solar panel can start the charge controller. However I still needed a way to start the box without solar power, hence the momentary push button to bypass the BMS. The balance check at the bottom is to check the total voltage and the voltage of each cell. 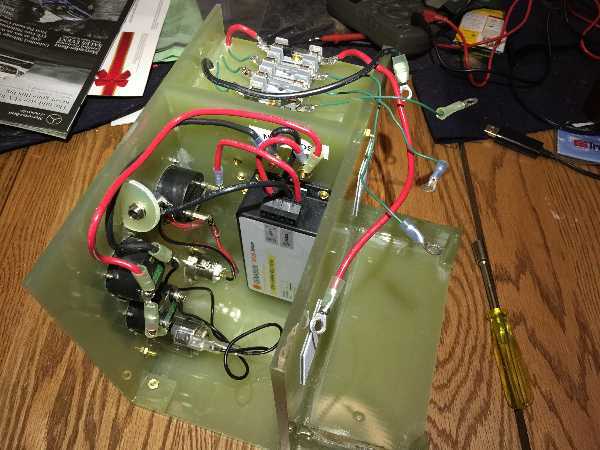 It uses a single volt meter wired to the individual cells with a 2S6P rotary switch. It has the positions for off, each cell voltage and total stack voltage. This is a convenient way to check if cells are out of balance. 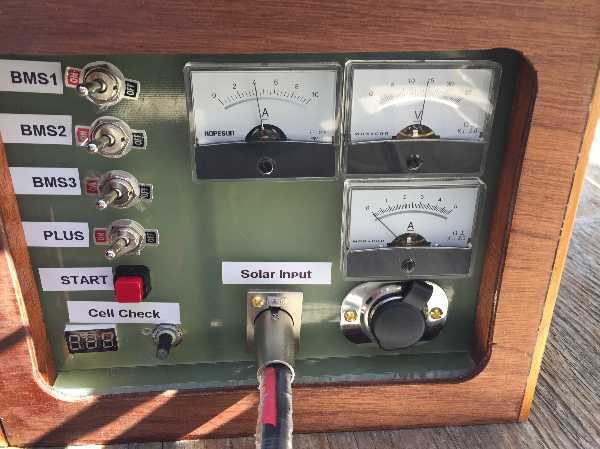 In the top middle is the ammeter showing the input to the batteries from the solar panel. At the bottom middle is the plug into the solar panel. At this point it's an XLR type connector. Later on I switched to a trolling motor plug which has a higher current rating. On the right hand side is a volt meter and ammeter showing the state of the output side. 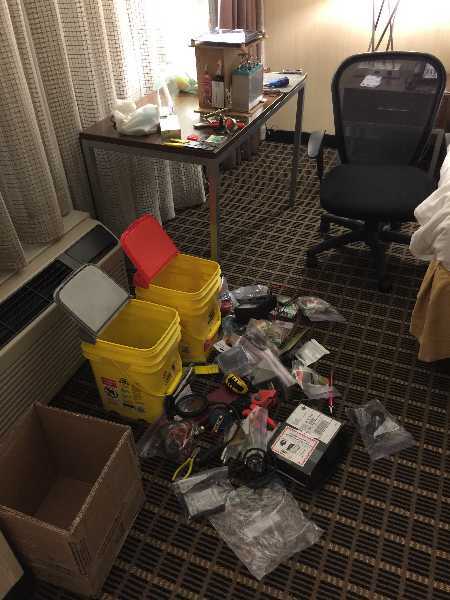 At the bottom right is a cigarette lighter type connector for plugging in useful thinks like celll phone car chargers, 12v vacuums and small inverters. This is a later tri-fold panel that I made out of Sapele. 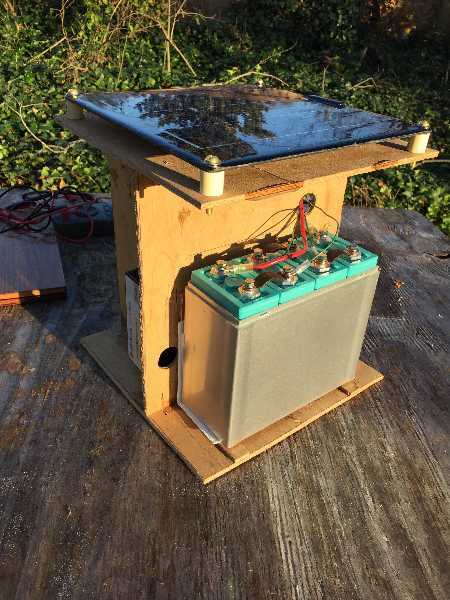 It uses Aleko flexible solar panels. I took this picture in July 2017. This has turned out to be a useful piece of equipment in its own right. 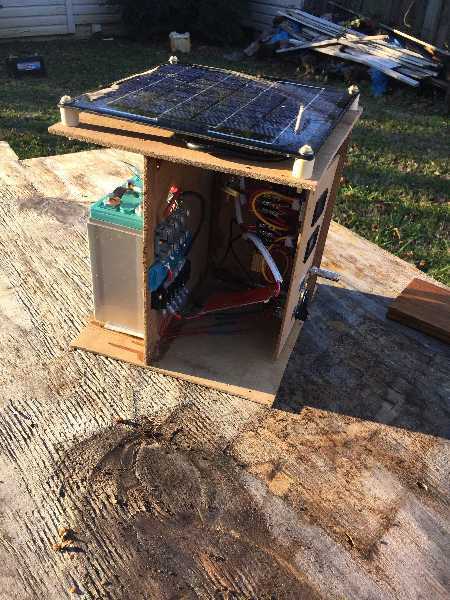 In September 2016 it powered a fan in a gazebo where there was no outlets. It also provided sufficient 12v DC power for a hand held vacuum. It is a ready source of power if there is a prolonged blackout such as the one from April 27 to May 1, 2011 in north Alabama. A higher capacity charge controller such as a Victron 75-15 which allows customizing various parameters. An integrated inverter for some power tools. An amp hour meter to show the actual state of charge of the batteries. Finalize the front face of the unit and add a rain shield.